This panel is a very typical version of a popular subject. 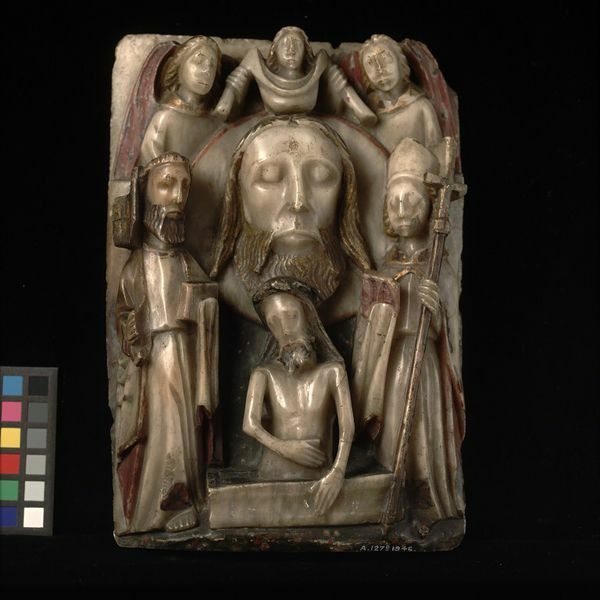 The head is set on a platter and flanked by figures of St Peter and an archbishop, probably Saint Thomas Becket. Christ appears at the bottom as the Man of Sorrows, rising from his tomb. At the top, two angels are shown carrying the Saint's soul away in a napkin. The head of St. John the Baptist is represented, upper lip half clean-shaven and with a spade-shaped beard, on a dish. Above, two angels bear a small figure in a napkin (only the head and neck visible), representing the soul of the saint. Below is our Lord's Pity with Christ, bearded and wearing the torse, his head inclined to the left, standing in the tomb, his right hand held against his body, the left against the outer edge of the tomb. On the left, facing inwards, stands the bearded and tonsured St. Peter, wearing a girded gown and a cloak; he holds a key in his right hand and a closed book in his left hand, which is covered by his cloak. On the right, facing inwards, stands the mitred figure of an archbishop, probably St. Thomas Becket, wearing a girded gown and cloak; he holds a cross-staff in his left hand and a closed book in his right, which is covered by his cloak. The top right corner of the panel is chipped. St. Peter's key is damaged. The jaw of St. Thomas is damaged. The bottom of St. Peter's gown is chipped. Green paint and the usual daisy pattern remain on the ground on the lower part of the panel. Gilding on a brownish primer remains on the hair and beard of the Baptist and of the other figures. The angels' wings are red flecked with white around black dots. St. Peter's key is gilt. The cross-staff is brown, its top gilt. The back of the panel bears two lead-plugged holes. The bottom has been cut away. Found in the church at Yarnton, Oxfordshire. On loan from Dr W.L. Hildburgh since 1926. Given by W. L. Hildburgh, 1946. Alabaster panel depicting the head of St John the Baptist. English, late 15th century.